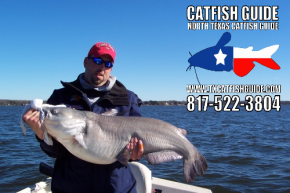 Catfish guide service for blue catfish, channel catfish and flathead catfish on North Texas area lakes. 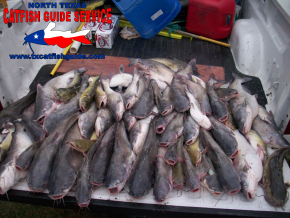 Fall and Winter are a great time for catfishing in North Texas. 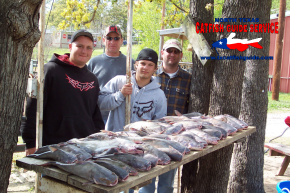 Whether you want to catch numbers of blue catfish or try your hand at catching a trophy class blue catfish, this is the time of year to do it! Just give us a call at 817-522-3804 to book your trip today! 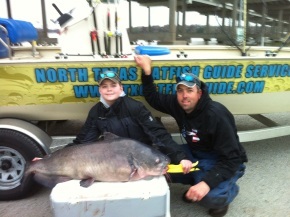 On December 23rd 2011 my son Lane Ferguson caught a 66.28 lb blue catfish setting a new record for Texas State Junior Angler Blue Catfish. He also broke numerous water body record breaking six records total. For more information check out our Texas State Junior Angler Record information. Spring catfishing is the time for fast and furious blue catfish action and big numbers of blue catfish. This is catfishing action like you have never seen before and some trophy blue catfish mixed in as well. You'll be surprised at where and how we catch these catfish and the excitement that takes place when we start fishing! The trips fill up fast so book early. 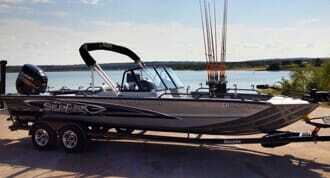 Summer is the time for big numbers of channels and blues and fast fishing action. The channel catfish bite is red hot all summer long, the blue catfish bite is good too. 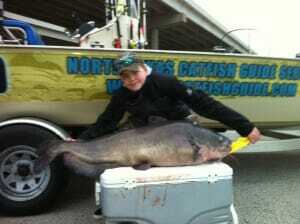 Book your summer trip for some fast and furious fishing action and an ocassional bigger catfish mixed in! Come fish from our SeaArk ProCat 240 catfish boat for a dry comfortable ride, a great day of fishing and the latest cutting edge technology.